Summer means lots of outdoor entertaining and the festive season brings its fair share of parties. Make your entertainment area a delight to behold with the addition of some container plants. Party on the patio this December season! If you are one of those people who avoids having a house party because of the new carpets, simply move your friends onto the patio. After all, life is a garden and the patio is just an extension of the garden! For patio party success you will have to shop first and then party. Most important are the containers or pots that furnish your patio. Anything that holds soil can be used as a container; from old zinc buckets, rusted jam tins and baths to state-of-the-art urns and designer patio pots. Whatever you choose must have drainage holes and be an appropriate size for the plants used. A pot that is too small will not hold enough moisture to allow the plant to thrive. Don’t forget to add bags of potting soil, fertiliser and of course plants to your shopping trolley. Impress your guests with a mini herb bar on a handy windowsill. Small pots of mint can provide do-it-yourself flavouring for the punch; rocket and cress for the salad; rosemary and sage for the braaied chops and fennel for the grilled fish.Patio gardening in containers has its pros and its cons; containers offer flexibility in finding the right amount of sun, shade, wind or cold for a particular plant but on the less positive side they require more work when it comes to watering. Plants cannot just be left in the ground but need more regular watering than garden plants. When planting up a big pot, try sinking a plastic bottle with holes pierced into the bottom and the top just protruding above the soil. Fill this with water to help keep the soil moist for longer. Start a new fashion with pots of veggies right there ripe for the picking. Tomatoes are great in pots on sheltered patios; the more you restrict their roots the better they fruit. Keep them well-fed and watered, stake if necessary and when they are flowering nip out the tips to encourage heavy crops. Try contrasting colours of pots and plants - greeny-yellow patty pan squashes dangling magically from a staked plant in a blue ceramic container, red chilies adding a zing to a deep green one. With all these veggies and herbs on the sunny side of the patio the party needs some colour in the shady spots. Hydrangeas are some of the showiest flowers in the summer garden and perfectly at home in pots on a shady patio, provided they are watered copiously. The flowers come in shades of blue and pink, and in white. Happily for gardeners the breeders are providing exciting new varieties which retain their colour longer. Hydrangeas are big feeders, especially in pots and can be fed with little effort with their very own hydrangea food. Hydrangeas are perfect in pots on their own but if you feel they need something at their feet you could embellish them with a charming little annual that enjoys similar shady conditions - the wishbone flower or torenia. 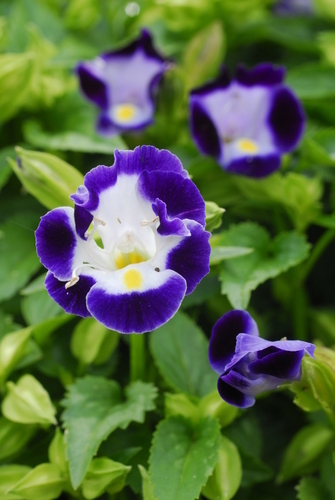 The plants make a compact, upright bush with flowers of pale violet, sporting a touch of yellow. They bloom right throughout the summer and well into autumn; being happiest in a well-drained, compost rich soil just like their house-mates the hydrangeas. Are your friends a bit rowdy and in the habit of falling off the patio edge into the border? If so, line the edge of the patio with a protective row of pots filled to overflowing with a cheery mix of hardy annual vinca. 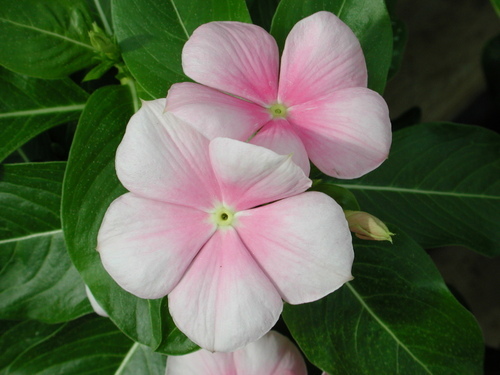 Their medium height, all-season blooming in shades of white, pink and rose and drought tolerance (you can wait to water vinca until the leaves just begin to wilt) ensures they do particularly well in containers. Fertilise monthly with a water-soluble plant food. Most good parties will go on until dark so make plans for lighting. Candles in glass bottles can light up pond edges and lanterns in trees add to the festive mood where life is a garden and a party too.